(Rick Bowmer | The Associated Press) In this Wednesday, Aug. 22, 2018, photo, shows moon rocks encased in acrylic and mounted on a wooden plaque at the Clark Planetarium, in Salt Lake City. A former NASA investigator who has spent more than a decade tracking missing moon rocks is closing in on his goal of finding all 50 lunar samples gifted to U.S. states after Neil Armstrong's first steps on the moon. In recent weeks, two more of the moon rocks that dropped off the radar after the 1969 Apollo 11 mission have been located in Louisiana and Utah. A strange thing happened after Neil Armstrong and the Apollo 11 crew returned from the moon with lunar rocks: Many of the mementos given to every U.S. state vanished. Now, after years of sleuthing, a former NASA investigator is closing in on his goal of locating the whereabouts of all 50. In recent weeks, two of the rocks that disappeared after the 1969 mission were located in Louisiana and Utah, leaving only New York and Delaware with unaccounted-for souvenirs. Attorney and moon rock hunter Joseph Gutheinz says it "blows his mind," that the rocks were not carefully chronicled and saved by some of the states that received them. But he is hopeful the last two can be located before the 50th anniversary of the Apollo 11 mission next summer. "It's a tangible piece of history," he said. "Neil Armstrong's first mission ... was to reach down and grab some rocks and dust in case they needed to make an emergency takeoff." 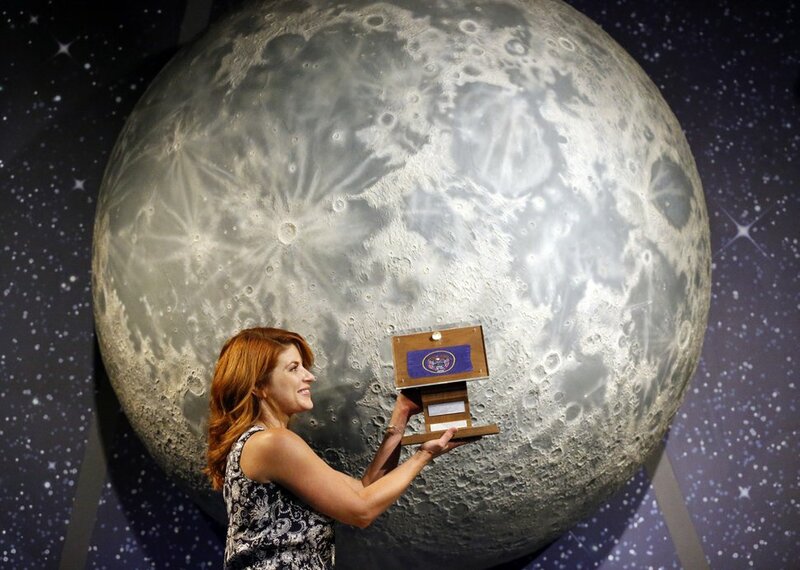 (Rick Bowmer | The Associated Press) In this Thursday, Aug. 23, 2018, photo, Lindsie Smith, from the Clark Planetarium, holds moon rocks encased in acrylic and mounted on a wooden plaque at the Clark Planetarium, in Salt Lake City. A former NASA investigator who has spent more than a decade tracking missing moon rocks is closing in on his goal of finding all 50 lunar samples gifted to U.S. states after Neil Armstrong's first steps on the moon. In recent weeks, two more of the moon rocks that dropped off the radar after the 1969 Apollo 11 mission have been located in Louisiana and Utah. Each state got a tiny sample encased in acrylic and mounted on a wooden plaque, along with the state flag. Some were placed in museums, while others went on display in state capitols. But almost no state entered them into archival records, and Gutheinz said many lost track of them. When Gutheinz started leading the effort to find them in 2002, he estimates 40 states had lost track of the rocks. "I think part of it was, we honestly believed that going back to the moon was going to be a regular occurrence," Gutheinz said. (Rick Bowmer | The Associated Press) This Wednesday, Aug. 22, 2018, photo shows a plate mounted on a wooden plaque that holds moon rocks encased in acrylic at the Clark Planetarium, in Salt Lake City. A former NASA investigator who has spent more than a decade tracking missing moon rocks is closing in on his goal of finding all 50 lunar samples gifted to U.S. states after Neil Armstrong's first steps on the moon. In recent weeks, two more of the moon rocks that dropped off the radar after the 1969 Apollo 11 mission have been located in Louisiana and Utah. But there were only five more journeys before the last manned moon landing, Apollo 17, in 1972. Of the Apollo 11 rocks given to other countries, about 70 percent remain unaccounted for, he said. The U.S. government also sent out a second set of goodwill moon rocks to the states and other nations after the Apollo 17 mission, and many of those are missing as well, he said. NASA did not track their whereabouts after giving them to the Nixon administration for distribution, said chief historian Bill Barry, but added the space agency would be happy to see them located. Gutheinz began his career as an investigator for NASA, where he found illicit sellers asking millions for rocks on the black market. Authentic moon rocks are considered national treasures and cannot legally be sold in the U.S., he said. He became aware while at NASA that the gifts to the states were missing, but only began his hunt after leaving the agency. Now a lawyer in the Houston area, he's also a college instructor who's enlisted the help of his students. The record their findings of the whereabouts of the discovered moon gems in a database. Many of the Apollo 11 rocks have turned up in some unexpected places: with ex-governors in West Virginia and Colorado, in a military-artifact storage building in Minnesota and with a former crab boat captain from TV's "Deadliest Catch" in Alaska. In New York, officials that oversee the state museum have no record of that state's Apollo 11 rock. In Delaware, the sample was stolen from its state museum on Sept. 22, 1977. Police were contacted, but it was never found. The U.S. Virgin Islands territory, meanwhile, cannot confirm that they ever received a goodwill rock, though the University of the Virgin Islands later received Apollo 11 rocks for scientific research, said chief conservator Julio Encarnacion III. In other states, though Gutheinz has recently hit paydirt. The Advocate newspaper in Baton Rouge located Louisiana's Apollo 11 moon rock in early August after a call from Gutheinz. (Rick Bowmer | The Associated Press) In this Wednesday, Aug. 22, 2018, photo, shows moon rocks encased in acrylic at the Clark Planetarium, in Salt Lake City. A former NASA investigator who has spent more than a decade tracking missing moon rocks is closing in on his goal of finding all 50 lunar samples gifted to U.S. states after Neil Armstrong's first steps on the moon. 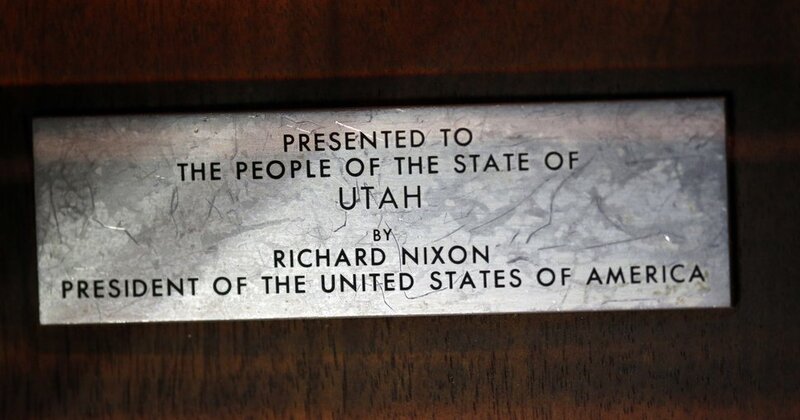 Each state got a tiny sample encased in acrylic and mounted on a wooden plaque, along with the state flag. 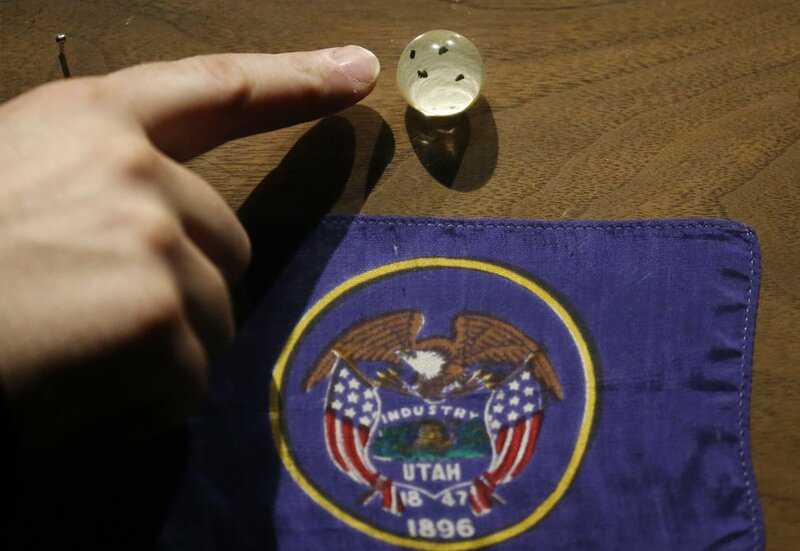 In Utah, the division of state history had no record of the sample, but The Associated Press confirmed it was in storage at Salt Lake City's Clark Planetarium. Officials there may bring it out as part of celebrations recognizing the Apollo 11 anniversary next year, something Gutheinz hopes to see everywhere.